Houston Cabinets is proud to be the area’s preferred KraftMaid Vantage cabinet dealer. When it comes to custom kitchen cabinets, Houston clients count on us to deliver the best brands and superior customer service. KraftMaid is one of the most well-known custom cabinet manufacturers in the business. 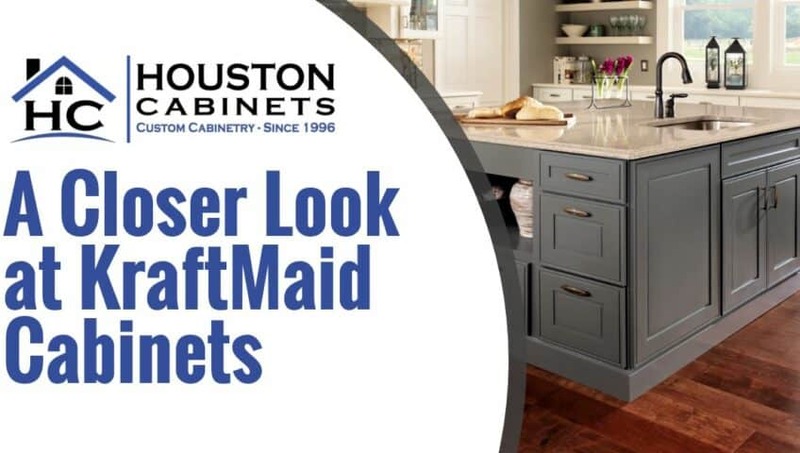 When considering a custom cabinet, Houston homeowners often inquire about KraftMaid. Let’s start our two-part article on features that makes KraftMaid Vantage among the most popular custom cabinet brands. KraftMaid Vantage boxes come standard with APC – All-Plywood Construction. Many manufacturers and big box stores charge fifteen to twenty percent additional for APC. Because this better-built box is standard with KraftMaid Vantage, not only do you get a better overall value, you get more design upgrades at a lower percentage cost based on door styles and finish options selected. Nearly every cabinet manufacture constructs their cabinet boxes using (MDF) Medium-Density Fiberboard or particle board. With KraftMaid Vantage, your cabinet boxes will be significantly more durable, stronger, sturdier and less likely to receive water damage. They are designed to last a lifetime. Vantage’s standard drawer runner suspension system features a smooth, ball bearing operation with a 90 lb. load capacity. Whisper Touch™ runner has an integrated drawer buffer that engages two inches from closing and applies resistance, giving a soft, controlled closing. Say goodbye to slamming drawers, sagging drawers and drawers that won’t stay closed. Natural Birch wood veneer interior preserves the inside of your cabinets and gives a feeling of high quality and value every time you open your cabinet doors. The interior finish of KraftMaid Vantage is stunning, think high-end furniture quality and finish. All shelving is full-depth, fully adjustable 3/4” natural Birch wood veneer with the same interior clear coat. Dovetail drawer boxes feature stronger, sturdier joints to ensure the drawer box lasts a lifetime. All drawer boxes come standard with 3/4” thick full-depth solid wood dovetailed drawer featuring four-sided construction and 3/16” plywood bottom. You’ll not find a better built, stronger, dovetail cabinet drawer box anywhere. Best of all, KraftMaid Vantage kitchen cabinets have a lifetime warranty. So come on, Houston and surrounding areas, what are you waiting for? There is no better time than now to consider new custom kitchen cabinets. Houston Cabinets is ready to help you design the space of your dreams. Give us a call today!